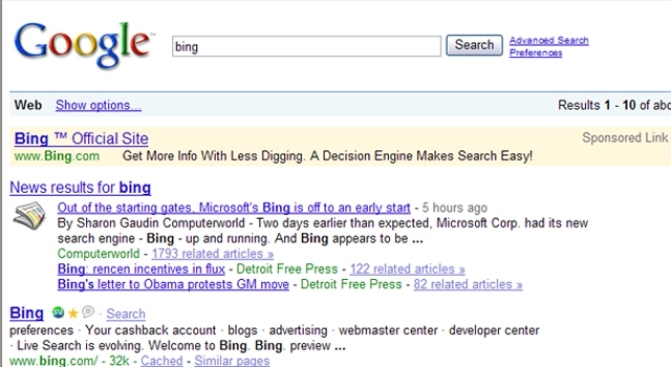 This screenshot shows Microsoft's advertisement on Google. It seems Microsoft doesn't mind getting a little help from its friends. Even if the software giant is trying to take them down at the same time. Bing, Microsoft's latest answer to Google, went live two days earlier than expected and the new search engine is even paying the Silicon Valley giant as it tries to steal its crown. If you do a Google search for Bing, you will quickly notice that the top sponsored link is an advertisement for the search engine, which we assume was paid for by Microsoft. Bad enough that the Seattle company had to mimic Google's functionality in its latest project. Even worse: It appears to have paid the Silicon Valley giant just to get word of its existence out.